This review is about item#7072073. I purchase to remove the bolt for removing the tire, I have used it only once, but I am sure that making it is also solid and active. This review is about item#7072082. The oil element used for our own German car has 30 mm hexagonal protrusion. 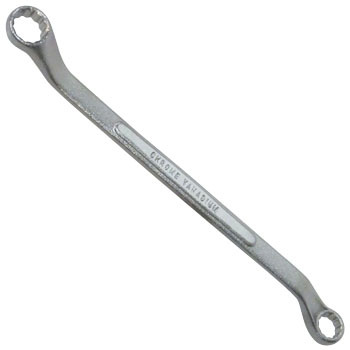 In a normal cup wrench, the part interferes and can not be used. Corresponding hand wrench has only motor wrench and it was hard to use in narrow place. This time, it happened to be a special price so I bought 24 x 30 mm double-ended glasses. In the first place, because the total length is 410 mm to accommodate the torque on the bolt with a head of 30 mm, it is slightly longer to lift the car with the car slope and remove the element. I cut it around the center and use it as a special tool. It is saved because I was able to buy it cheaply so I could use it. I will check bargain goods from now on. This review is about item#7072091. I use it for detaching the wheel when replacing the tire / brake shoe. It was saved because the price is cheap. Because it is cheap and precision is good, it is handy. This review is about item#07072073. This review is about item#08742641. This review is about item#08742657. It is a good wrench without deforming even if turning a hard screw etc. This review is about item#08742666. If it is DIY, I think that this price is enough for this price. Actually I wanted to buy a cheap set but I was out of stock so we ordered only things to use immediately. Recently lack of what you want stand out.